This unique event is a great opportunity for Juris family members to get together in one place. LexisNexis® Juris® Users from around the country have been asking for another Juris Conference. You asked and we listened. 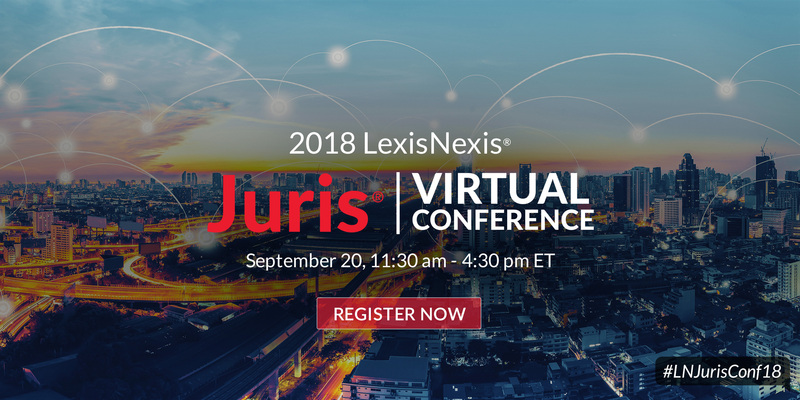 We are excited to have you join us at the 2018 LexisNexis Juris Virtual Conference on September 20th, from 11:30 am – 4:30 pm ET. This unique event is a great opportunity for Juris family members to get together in one place. Whether you are brand new to Juris or a master user, the Juris Conference is the perfect setting to hone your skills, network with colleagues, and learn from Juris product experts. It’s the best way to get the most out of your Juris / Juris Suite software. Plus, we are bringing the conference to you! This is not just your everyday webinar. The Juris Virtual Conference will be an interactive experience that allows you to fully participate in discussions and network with your peers. With live video streaming and interactive capabilities, you’ll have the chance to participate in every conversation, without having to leave your office. Gain valuable insights, build lasting relationships, and get the most out of your Juris software at the 2018 LexisNexis Juris Virtual Conference.